The reflow oven build described here is fully capable of fine pitch lead-free soldering at very high temperatures, and can do it consistently and reliably. The entire tray can be filled with PCB's, and all will reflow perfectly. It uses Controleo3, a 6-relay programmable reflow oven controller. If you're looking for the ControLeo2 build guide, click here. Size - a small oven has less metal and air to heat up (less thermal mass). The oven in this guide is just 10 liters. Larger ovens require significantly more power to heat up. Get the smallest oven that will work for you. Power - a lot of power is required to get the right rate-of-rise at high temperatures. The oven in the guide is rated at 1150W. We add an extra heating element to bring the total power up to 1500W. Type of element - the elements should ideally be quick to heat up and cool down. Resistive heating elements are extremely slow to heat up and cool down, and make it difficult to follow a reflow profile. Infrared elements are usually a poor choice because they heat up dark components before lighter or shiny ones. Commercial ovens use infrared elements, but only to heat the air which is then blown onto the boards. The compromise is to use quartz infrared elements which emit less IR. They are typically shielded with a perforated steel sheet which limits direct radiation. Also, Controleo3 will limit how much the top element is used to further reduce uneven heating. Ability to heat top and bottom independently - some cheap ovens turn the top and bottom elements on together, with no way to control them individually. Avoid those - you need to be able to control where the heat is coming from. Convection fan - there is no doubt that a convection fan is a good thing. However, convection ovens are typically much larger and have less power for the volume. We have done a huge amount of testing on both oven types, and only recommend convection ovens if more PCB space is needed. Even then, you'll need a lot of insulation and for best performance your should consider buying a 2nd oven and donating its elements to the first. Consider using a low-temperature lead-free paste like Chip Quik SMDLTLFP10. Available power - Most USA outlets are rated at 110VAC 15A. This means that 110V x 15A = 1650W is available, though that should be derated by 20% if the oven is on continuously. The oven in this guide starts out at 1150W and a 350W boost element is added. This give a 10% safety margin, which is fine because it is rare that all elements are on at the same time during a reflow, and reflow durations are short. If you convert a convection oven, you may need a 20A outlet or a 240V circuit. For this guide we found a suitable oven on Amazon.com. It was a brand new Black & Decker T01303SB toaster oven for just $30 shipped! Black & Decker sells many ovens with the same chassis (like the TO1322SBD, TO1332SBD and TO1313SBD), but with different controls, color or handle design so your oven may not look exactly like this one. It doesn't have a convection fan and the power consumption is 1150W. The "low" power consumption means we can add an additional heating element without blowing fuses. There are 2 heating elements - 600W on top and 550W on the bottom. The internal volume is small at 10 liters. The area for PCB's is 8"x10.5" (200mm x 260mm). Perfect! Controleo3 can control 6 relays. In this guide only 3 of the outputs are used: bottom element, top element and boost element. The door servo does not use any of the outputs; it is controlled separately. The oven in this guide may be unavailable in your area, or you may want to use a different oven - perhaps with a convection fan. A convection fan is nice to have but most convection ovens are larger, cost more and are more difficult to modify. The conductive properties of aluminum in the PCB tray and insulation (Floor & Tunnel Shield II) is more effective at eliminating temperature differentials than moving air. Look at the forum discussion here and other customer's ovens here. The 6 considerations listed above are all relevant to your choice of oven. Consider making a fake wall to reduce the internal volume. Eliminating the "pizza bulge" will help a lot. A boost element should be added, but doing this will put the power draw beyond what a 15A circuit can provide. You may have access to a 20A circuit - great! If you don't add a boost element you'll need to go overboard with insulation. In addition to insulating the inside of the oven (Reflect-A-Gold and Floor & Tunnel Shield II) you should also add some ceramic blanket insulation between the oven chamber and the outer shell. Use SSR's for the heating elements. The convection fan could be wired to be on all the time, or you can use a mechanical relay or small SSR to control it. If your SSR's are switching large loads, consider adding passive (heat sink) or active (fan) cooling to them. If you end up with an oven that is under-powered or under-insulated, consider using lead-free solder paste with a lower liquidus temperature (around 138°C) like Chip Quik SMDLTLFP10. Common problems in home-made reflow ovens (or cheap commercial ovens) are hot and cold areas. A cold spot is an area that doesn't get enough heat to activate the flux at the right time, and allow the solder to reach liquidus temperature and reflow. A hot spot is an area that get too much heat and results in warped or blistered boards. Components can discolor, but some of the worst damage is what you can't see; the mean-time-before-failure (MTBF) of burnt IC's can be severely compromised. All elements can be run cooler, so there isn't an intensely concentrated heat source. Good insulation is absolutely necessary when building your own reflow oven. It is almost impossible to have too much insulation. If you're using leaded solder paste and only reflowing a single small PCB at a time then it is possible without insulation. However, the goal in building this oven is to be able to use the entire oven tray for PCB's using high-temperature lead-free paste. Quality insulation capable of withstanding high temperatures is expensive but worth it. We recommend using Reflect-A-Gold, Floor & Tunnel Shield II and ceramic fiber blanket. In this guide, Reflect-A-Gold and Floor & Tunnel Shield II are used inside the oven to prevent heat loss to the steel oven walls. Ceramic fiber blanket insulation is added to the outside of the oven chamber (and inside the outer shell) to further reduce heat loss. We also use a high-temperature silicone glue to seal the air gaps between the oven panels and Nomex high-temperature gasket to reduce the air gap around the oven door. There is fake Reflect-A-Gold available on the Internet. It looks the like the real deal, and our testing shows the insulating properties to be very similar. However, the adhesive on this tape doesn't stand up to the high reflow temperatures as can be seen here and here. Some insulation (we're looking at you, Heatshield Products) rated to higher temperatures than Reflect-A-Gold don't work as well. By reflecting or conducting heat, it helps to eliminate hot and cold spots in the oven. Good insulation means less energy is needed to reach high temperatures. This means the heating elements can run cooler, further helping to even out temperatures in the oven. For this particular oven, the bottom element runs at a 95% duty cycle without insulation, but just 55% when insulated. One is good, more is unnecessary. If the desire is to get an average reading you can connect multiple thermocouples in parallel. Thermocouples generate a micro-voltage that is read by the MAX31856 IC, so wiring them in parallel will give you that average. If the desire is to measure temperature variance around the oven, the best method is to use Temperature Test Labels, as shown here. This will give you a more accurate picture of the variance and let you know where the hot and cold areas are in the oven. This build uses high-temperature silicone glue to seal air gaps. This glue is supposed to have a set time of 1 hour, and be fully cured in 24 hours. The reality is that we are applying it rather thick so the curing time is much longer. We recommend at least 24 hours between applying the glue and continuing with the build. In our experience it often takes 3 or 4 days to fully cure. The average time needed to build this oven is around 8 hours (excluding glue curing time). One customer told us he did it in 5 hours, and one person did it in 7 months. This is the 3rd major revision of this guide. We've been refining our kit contents and build methods to make it easier and quicker to build, and perform better. You're welcome! The guide is designed to get you quickly into the gluing sections (step 4 and step 12), and allows you to build some sub-assemblies while waiting for the glue to dry. Do not run your oven through its learning cycle or do a reflow until the glue is fully cured. Tip: if you're planning a weekend build you may want to do a little bit on Monday and Wednesday. Tip: do not unwrap the white ceramic fiber blanket until step 16! Caution is needed. Tip: think about ordering an aluminum tray if you haven't already done so. One tray is included in the build kit. To keep things safe and to make space for the new controls you should remove all unnecessary parts from the oven. Identify the wiring used by the elements; you'll need to connect them to the SSR's in step 13. When cutting wires, leave them as long as possible; they need to be able to reach your SSR's. Save any wire from the oven; it is high-temperature wire that could come in handy later. The top control is removed because that is where the wires to the controller will be fed through. Ovens come with huge air gaps that will allow hot air to escape. In this step we remove the rear panel of the oven, and seal all the gaps that exist. Then the back panel is replaced. Tip: You can use a light inside the oven to help identify where the gaps are. Tip: When smearing glue with your finger, be careful of sharp edges. Smear the beads to glue to better seal the gaps, and help the glue cure faster. The front corners of the oven, and the gaps around the heating elements are closed too. Tip: Do the next few sections while waiting 24 hours or longer for the glue to dry. Controleo3 supports both mechanical and solid-state relays (SSR). If you don't plan to use your oven much, or if you don't have 2 pennies to rub together you can use mechanical relays. The contacts in mechanical relays do wear out over time. SSR's have no moving parts so they aren't affected by physical shock, vibration or changes in altitude. They operate silently and produce little electrical interference. They don't produce any arc so they are suitable for hazardous environments. We only use SSR's when building reflow ovens. We make six 3/16" holes for the SSR's, a 3/16" hole for a zip tie (step 13) and a 1/4" hole for the wire from the bottom element to pass through. Cut the blue thermal pad into 4 pieces. Remove the plastic cover on both sides, and place it on the back of the SSR's. Trim the pad to fit. Tip: remove burrs on the hole the wire will be fed through. A countersink bit is good for this. We've decided to mount the 5V power supply for Controleo3 inside the oven. The control chamber (with the relays and power supply) gets warm during a reflow - but nowhere near hot enough to damage the power supply or melt PVC-covered wiring. While you must use high-temperature (silicone or fiberglass) wire inside the oven and for any wires touching the oven walls, ordinary PVC wire can be used in the control chamber. The power supply needs some wire attached to it. The wire is crimped onto female spade connectors, shoved onto the blades of the power supply and then covered with heat shrink. Don't cut the leads yet - they need to be uneven lengths. Cut the power connector off the end. Tip: before doing this, it might be a good idea to test the power supply and Controleo3. Cut the power connector off, strip the wires and screw them into Controleo3. Figure out where Controleo3 will be mounted. Make sure the oven door can still open (don't forget about the servo bracket), and the oven can be put back together! The servo is attached to the enclosure using a custom Whizoo servo bracket. An aluminum plate used to attached Controleo3 to the oven is also attached. We know, we know, technical drawings showing measurements would be nice, but none of these placements is very critical. The photos should give you a good idea of where everything goes. The hole in the enclosure is for the wires to pass through, and 7/16" seems to be the right size. A step drill bit makes a nice, clean hole. The holes in the aluminum plate are 9/64" for the bolts, and 1/8" to attach everything to the oven in the next step. The servo is attached to the bracket using the screws that came with the servo. These screws are pretty weak so consider using other screws you have lying around. The fit is pretty tight so you need the right size Philips screwdriver, and consider using a drill to enlarge the 4 holes in the bracket if necessary. Keep the black M3 screw - you'll need it to attach the servo arm in step 18. Screw it into the servo for safekeeping. Tip: real men (and women) would use rivets to attach the aluminum plate to the enclosure. Tip: don't underestimate the spatial perception needed to figure out where the aluminum plate goes. It could go on the left or the right, facing up or facing down - but only one combination is correct. Tip: hopefully the glue is sufficiently dry now that metal shavings don't get stuck in it. A hole for the wires from the boost element into the control chamber (7/32"). 2 holes for the zip tie that will hold the power supply (7/32"). 2 holes to hold the SSR plate in place (9/64"). Remove the screws in that location first. 2 holes in the oven to mount the enclosure (1/16"). Firmly attach the SSR plate to the oven. Avoid using the wall to the oven as a mount point. Take care to ensure no metal filings are left behind! When you're done, make sure the wires for the thermocouple and the boost element fit through their respective holes. Tip: use a countersink bit to deburr the holes! Tip: resist the temptation to put the white ceramic fiber blanket behind the aluminum plate at this time! Yes, it is easier to do it now but you'll be fighting ceramic dust for a long time. Tip: you can remove the enclosure for now and re-install it again in step 14. It makes installing the insulation more difficult. We insulate the inside of the oven to prevent heat from being lost to the steel oven walls. Reflect-A-Gold is applied first. This insulation is capable of handling continual temperatures up to 450°C (850°F). The goal of this insulation is to minimize heat loss through the oven door and to reduce the thermal mass of the oven by reducing the amount of heat lost to the steel chassis. Reflect-A-Gold works by reflecting heat back to where it came from. We do a "best effort" when applying the Reflect-A-Gold, and don't cover the whole oven. The loss through the uncovered steel walls is minimal (small surface area), and the ceramic fiber blanket more than makes up for it. Use a large piece so if the glue directly above the element fails it will still be held in place. Make sure the insulation is firmly pressed down, to ensure the adhesion of the glue and maximize the space between the element and the roof of the oven. A screw is inserted through the Floor & Tunnel Shield II as insurance. By default, the power to the top element is intentionally limited to 75%. This can be overwritten by the reflow profile file if necessary. Always test-fit the Floor & Tunnel Shield II before peeling the backing off and exposing the adhesive. To place the Floor & Tunnel Shield II, the best method is to make a cut down the center. Peel the plastic backing off and place the 2 pieces further apart so that the middle 1/3 is sticky. Feed the Floor & Tunnel Shield II into position, and firmly press down on the middle. You can then bend up the edges and remove the rest of the backing - and press down the edges. The largest piece of Floor & Tunnel Shield II goes on the floor of the oven. Tip: (convection ovens) if you need to place 2 pieces of Floor & Tunnel Shield II next to each other, keep in mind how aluminum conducts heat. The pieces should stretch from hot spots (elements) to cool spots (corners). For example, a 2"-wide strip directly beneath a heating element is useless because the heat it absorbs won't be dissipaited. Tip: always test-fit the Floor & Tunnel Shield II before peeling the backing off. Add spacers (small pieces of Floor & Tunnel Shield II) to the back of the oven. This prevents the tray from being flush with the back of the oven, which helps airflow and will give more consistent results. Don't forget to add a screw (or rivet) as insurance if the adhesive fails. Keep a small piece of Reflect-A-Gold to insulate the around around the thermocouple (step 19). 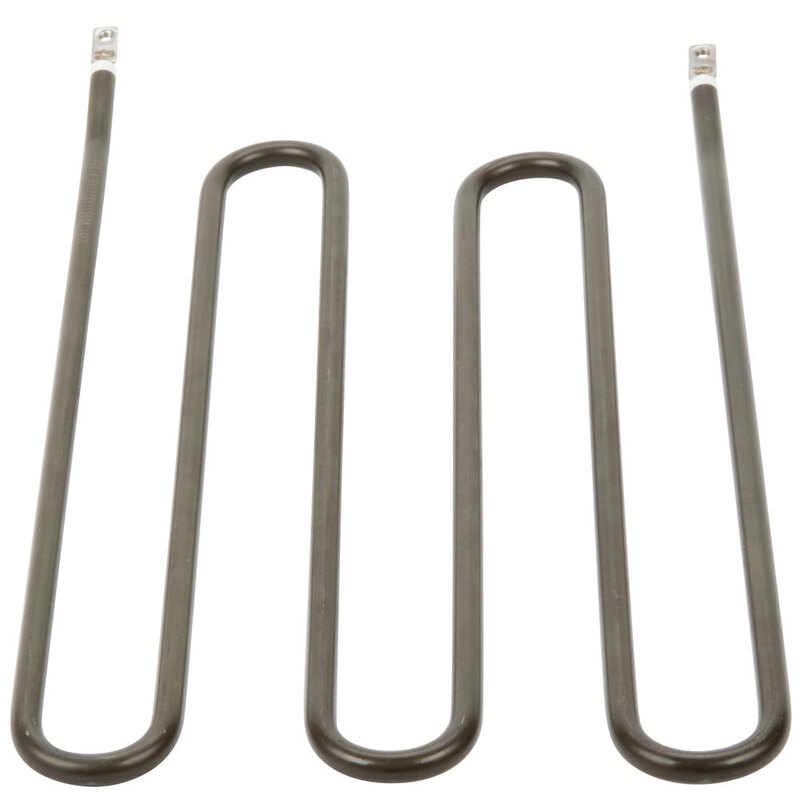 The boost element is a 110V 350W resistive heating element normally used for heating molds. It helps installation to have one eye bolt fit snuggly on the element, but isn't absolutely necessary because the element will be held in place by the wires glued to the side of the oven. You can enlarge or reduce the size of the eye hole using a vise or hammer. Make a hole through the Floor & Tunnel Shield II using the holes you made in the oven earlier as a guide. An awl is the right tool for this, but any sharp, pointy object will work. Put the element through the eye bolts and then put the bolts through the holes. Make sure everything is bolted down securely. You should have 3" or 4" of the thermocouple inside the oven. Tip: masking tape is used to hold the thermocouple in place while the glue dries. This must be removed before closing the oven otherwise it will burn! This is the last bit of gluing. Seal the holes around the thermocouple and the boost element wires. Don't forget to remove the piece of tape once the glue is dry. Tip: if you need more wire, you may be able to take some from the boost element or the blue silicone wire. The thermocouple generates a micro-voltage based on the temperature of the oven. Running the thermocouple close to high-voltage AC wires will induce noise into the temperature reading. Keep as large a gap as possible between the high and low voltage wires. Make sure the clearance exists behind the aluminum SSR plate too; sometimes the thermocouple rests against the top or bottom element wires. Feed the wires through the grommet and through the braided sleeving. To keep things neat and secure, we use 10" of 1/4" braided sleeving along with zip ties. Tip: the 3rd photo below shows the best method to feed the wires through the grommet and enclosure. Tip: make sure the thermocouple wire isn't close to high-voltage wire! Next we'll get power and temperature to Controleo3. The good news is that Controleo3 has reverse polarity protection - but still, don't reverse the power wires. More good news is that you won't cause damage if the thermocouple wires are reversed either. If they are reversed, the temperature will go down when it should go up - or vice versa. So go ahead all you color-blind people - you have a 50% chance of getting it right! Avoid repeatedly bending wires past their breaking point. Hopefully you left your wires long so you can strip them again if necessary. Remove the plastic film protecting the LCD display. Tip: unscrew all the screw terminals you plan to use now. Tip: take care you don't have any "careless whiskers" when putting wires into the screw terminals. Make sure your high-voltage wiring is safe, then plug in the oven. Controleo3 should receive power and start up in 3 seconds. Look at the temperature reading on the display. It should read room temperature (around 25°C). Carefully place your hand inside the oven and touch the tip of the thermocouple. The temperature should rise - unless you have cold hands. If the direction of temperature change isn't correct then reverse the red and green wires. Finish screwing the remaining 4 wires into Controleo3, and close the enclosure. Keep an eye on the USB port - that has to be inserted first. When putting the lid on the enclosure, take care not to overtighten the screws. The lid can press down on the touch screen and interfere with touch readings. Make sure your high-voltage wiring is safe, then plug in the oven. Controleo3 should receive power and show the Settings menu. Tap "Test" and then the "Turn On" button. This button should toggle the bottom element on and off. Take a look at the LED indicator on the SSR, and keep an eye on the element. Expect to hear some buzzing from the elements as they start to heat up. Toggle power on and off until you are satisfied that the bottom element is being controlled as expected. Ceramic fibers are very fine and sharp. They don't penetrate though thick skin, but can irritate thin tissue like eyes, nostrils and lungs. If you exercise precautions you won't have any problems. The blanket has amazing insulating properties, and the top of your oven will be barely warm during a reflow. Unwrap the ceramic fiber blanket just before you use it - not earlier. Scared? Don't be. Ceramic fiber is easy to work with as long as you take a few precautions. Tip: ceramic fiber is tough on scissors. Use an old pair you don't care about. Tip: An alternative to cutting the ceramic blanket to allow the cover to fit is to modify the cover. One customer used a Dremel, but you could probably use tin snips too. Well, good luck! Manufacturing tolerances for these ovens seems to be very tight and it isn't easy getting them back together again. At least you know that it is possible, because you took it apart. Tip: make sure all tape has been removed. It will burn at high temperatures. Tip: you might want to take a few photos of your masterpiece! Turn on the oven, and navigate to Setup (Settings -> Setup). Configure the outputs as you've wired them in step 14 and 15. Continue to navigate through the setup screens to the door open position. It should show 90° - this is the mid-point in the servo movement. If it doesn't show 90° then press the "+" or "-" button until it does. Attach the servo arm to the servo disc using four M3 screws. Mount the arm to the servo in what you think will be the mid-point of it's movement. Take a 3" x 1/2" piece of aluminum and drill 2 holes in it using a 1/8" drill bit. Give it a 90° bend as shown in the photos. Temporarily tape it to the oven handle while playing with the open/close motion (by going between the "Door open position" and "Door closed position" screens) of the door, and adjusting the aluminum to work. Drill 2 pilot holes in the oven handle using a small 1/16" or 5/64" drill bit. Attach the aluminum to the handle. The oven door should open around 1". That is enough to provide sufficient cooling after the reflow. The door servo is always moved to the closed position when the oven powers up. Typically, the door will be opened slowly soon after the maximum temperature is reached, and closed again when the oven cools to 50°C. You can change that behavior in the reflow profile though. Hopefully the glue on the thermocouple is fully cured now? Place a piece of Reflect-A-Gold on the wall of the oven. Position the thermocouple as shown in the photos. The exact placement isn't important; it is more important that it doesn't move between reflows so that you get consistent results. Tip: if you have any left-over Reflect-A-Gold you can place it on the steel oven walls now. To stop air loss through the door we place Nomex high-temperature gasket around the door. The Nomex should be cut in half. Tip: make sure there is airflow around the tray otherwise Controleo3 will be unaware of how much heat is coming from the bottom of the oven. Controleo3 uses a PID algorithm to follow the reflow curve. The most difficult part of PID is tuning the constants to work well with your oven. This is where Controleo3's learning cycle comes in; it will run some tests on your oven to determine the power and time needed to adjust the temperature. It takes around 1 hour to run this cycle. Another metric to come out of this learning cycle is that it will let you know how well your reflow oven has been built, and if it is lacking in any area. You can read more about this here. If your oven's performance is poor, you might be able to improve it. The learning cycle must be run with the oven with its typical reflow load. In other words, the aluminum tray must be inside the oven. You can add a PCB or two if you like. Anytime the oven is used, it must be done in a well-ventilated area. Initially you'll be getting some off-gassing from the adhesives used in the insulation but you'll also get fumes from the components, the PCB and the flux in the solder paste. If you want to monitor your oven's performance, you can install Arduino's Serial Monitor software on your PC and monitor the status messages using the Arduino Serial Monitor. Tip: always use your oven in a well-ventilated area. Use scrap PCB's and components you no longer need. Place some solder paste on the boards and some components. A simple test is the "yellow capacitor" test as documented in a Kickstarter update. A much better method is to use Temperature Test Labels, as shown here. If not using the door servo, when instructed to open the oven door open it an inch or two. Be careful not to let the cool down rate exceed 6°C/second; the optimal rate is 2°C/second. Once the oven cools to 100°C the boards can be removed, but you can leave them in longer so you don't need gloves to handle them. You can create your own reflow profiles by following this guide. To take a screenshot, tap 3 times in the top left corner of the screen. If there is a SD card, a bitmap of the screen will be written to the card. Writing the bitmap takes around 10 seconds, and Controleo3 will freeze during this time (so avoid doing this during a reflow!). You'll hear a beep every second to let you know something is happening. The touchscreen is calibrated as part of the final test procedures. If you feel it isn't accurate enough, you can recalibrate it. Go to Settings -> Stats -> Reset -> Touch Calibration. You should use a stylus for better accuracy. If the touchscreen isn't working at all, try loosening the enclosure lid screws or removing the lid completely. The pressure from the lid can push down on the touchscreen making it unresponsive. Controleo3 supports tap-and-hold. For example, when setting the bake temperature you can tap-and-hold the "+" arrow to quickly increase the temperature. Reflow temperatures are always given in Celsius, but if you're ever curious what the oven temperature is in Farenheit you can tap on the temperature in the top-right corner of the screen. Reading from or writing to the SD card is unbuffered, so the SD card can be removed without pressing an "eject" button. It feels weird, but you're going to like this a lot! There is a lot more going on behind the scene that what is displayed on the screen. Controleo3 continuously dumps information out of the USB port. To see it, attach a USB cable to your PC and run Arduino's Serial Monitor. You need the Arduino software on your PC anyway to be able to do software updates. If you're having problems with your oven's performance you can find helpful information here. OSHPark produces excellent quality boards and delivers them quickly. For most prototype boards, having a stencil reduces assembly time and improves soldering so much less rework is needed. We love stainless steel stencils, and have had success using OSH Stencils. For larger quantities we often order boards and stencils from PCBWay (use coupon code CD16CBDE) or Smart Prototyping in China. We personally use Chip Quik SAC305 lead-free paste and we're happy with the results. From feedback we've received, any no-clean lead-free paste appears to be as good as any other. Paste freshness is important; the flux in the paste will degrade over time. Keep it refrigerated per the manufacturer's instructions. Fine-pitch components and especially BGA's will need the freshest and best quality paste. If you're doing a low-frequency design with large component pads you can probably use cheaper, older paste. Solder paste manufacturers try to sell paste to contract manufacturers with conveyor belt reflow ovens. Time is money for them, so the reflow graph typically shows the shortest reflow duration under ideal conditions. All datasheets state something along the lines of "use this graph as a starting point for process optimization". Another point to keep in mind is that your oven doesn't get instantly hot when you turn it on, so it is best to zero-base profile graphs to 50°C or 75°C for a better comparison. Taking a longer time at lower (pre-soak) temperatures is almost inconsequential to the process. Your oven might do perfect reflows immediately, but it'll probably take a few tuning runs before that happens. You should take a closer look at your oven's performance numbers. You might need to modify the profile to suit your paste and your oven. The source code for Controleo3 is open-source, so if you'd like to improve this we'd love to share your efforts with our users!